KidStart Magazine > Family Life > All things baby > Coffee Shop Caffeine: Pregnancy Health Risk? Coffee Shop Caffeine: Pregnancy Health Risk? The things-to-avoid list has grown since my last pregnancy. This time round I was advised no alcohol, soft cheeses and raw egg, nuts, seafood and a few other things I now can’t remember. I kept to it because like all pregnant women I wanted to protect my pregnancy. However, coffee was never mentioned so it surprised me to see headlines last week about how pregnant women drinking coffee from a high street chains could be risking their pregnancies. The idea being that the caffeine levels in espresso shots from different coffee outlets were much higher than the UK recommended advice to pregnant women. With a coffee in one shop containing six times more caffeine than those bought in others. Currently the Food Standards Agency and the Royal College of Obstetricians and Gynaecologists recommend that that pregnant women should limit caffeine intake to 200mg a day with some doctors suggesting complete abstention in the first three months of pregnancy. 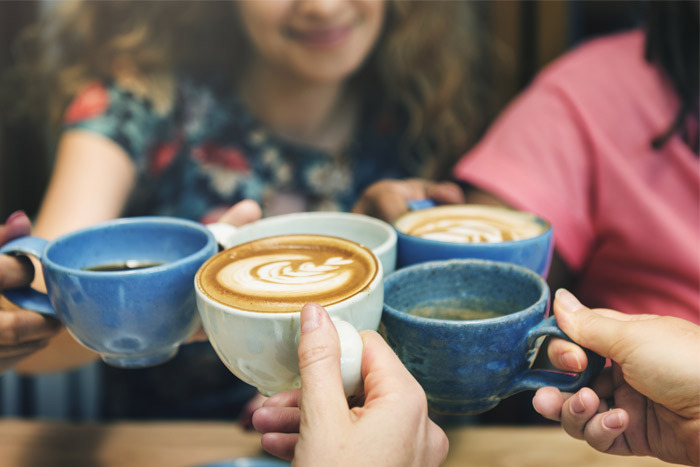 While the research from a University of Glasgow study is true, what’s not is the fact that pregnant women walk about consuming excessive amounts of coffee in cafes at an alarming rate every day. Most of the pregnant women I know either drink the odd coffee or steer clear of it completely due in part to the fact it gives you terrible indigestion when you’re pregnant. I agree women should be warned but do the papers really have to do an alarming ‘pregnant-mothers-beware’ story every single day? What are you thoughts? Do these stories scare you or do you ignore them?